Want that fashionable torn look on your jeans? Well look no further than Plaid's Denimolition. 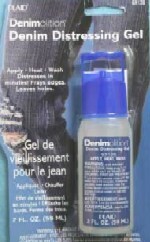 Denimolition is a distressing gel that cretes a worn look, holes or frayed edges for designer looks. Easy to use - just apply, heat and wash. Highly concentrated, water based silk paint, fixed by steaming, resulting in colours of fantastic brilliance and outstanding soft feel. 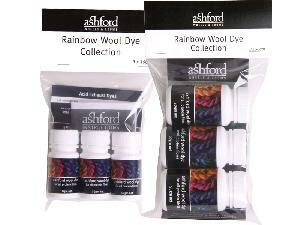 For textile design, arts and crafts, hobby and leisure use. SilkArt is available in an extensive, coordinated range of 60 brilliant colour shades including the primary colours of cyan, magenta and yellow - permitting colours to be precisely mixed in accordance with the theory of colours - as well as the latest trend and fashion colours. All the shades have good fade-resistance, can be intermixed and diluted with water or Marabu-Concentrated Thinner. Highly economical in use, Marabu-SilkArt is suitable for all types of silk, fine woollen fabrics and polyamide - for all silk painting techniques incl. microwave technique as well as for Dévoré dyeings "two-dyeings technique". Marabu-SilkArt reveals its full beauty after steam-setting and is then wash- and dry cleaning proof. 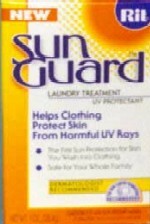 Laundry Treatment UV Protectant 1oz (28.4g). Your clothes may not offer enough protection from harmful UV rays from the sun. Rit Sun Guard puts an invisible shield into clothing that helps block more than 96% of the sun's harmful rays from reaching your skin.